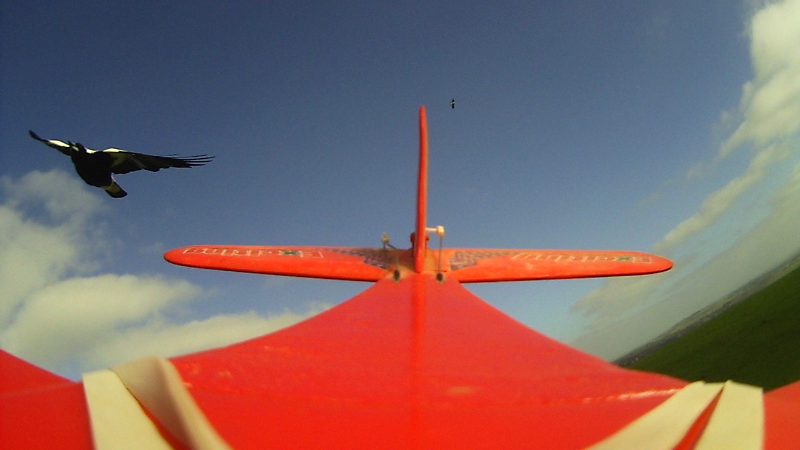 Can’t wait till this movie build is done and I can leave Camtasia alone! Our battle to the death continues! 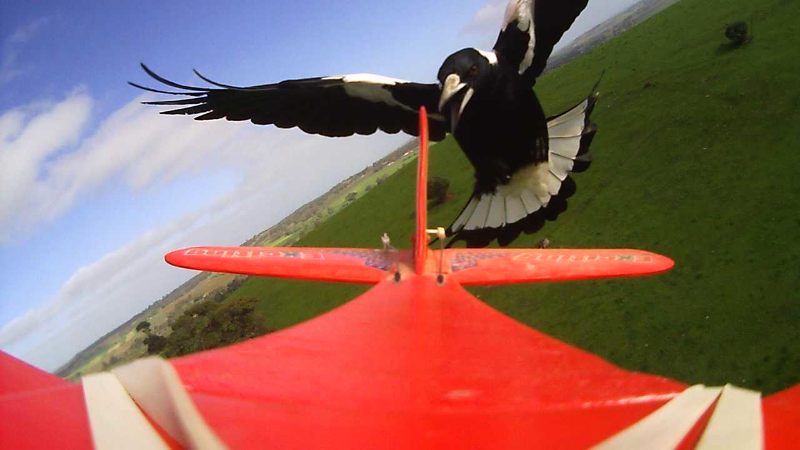 Spent the morning working with it and it hasn’t crashed – BUT it has eaten an entire project.The morning’s work is lost again. 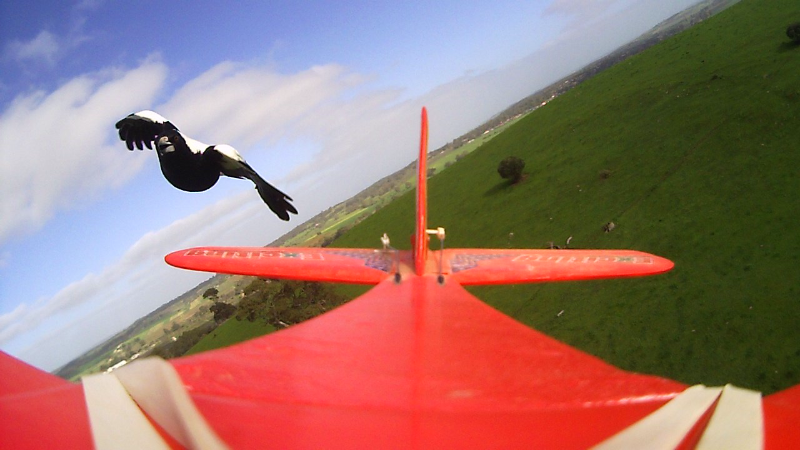 My deadline passed 8 days ago! I am so close to a result it would be crazy to change tools now. 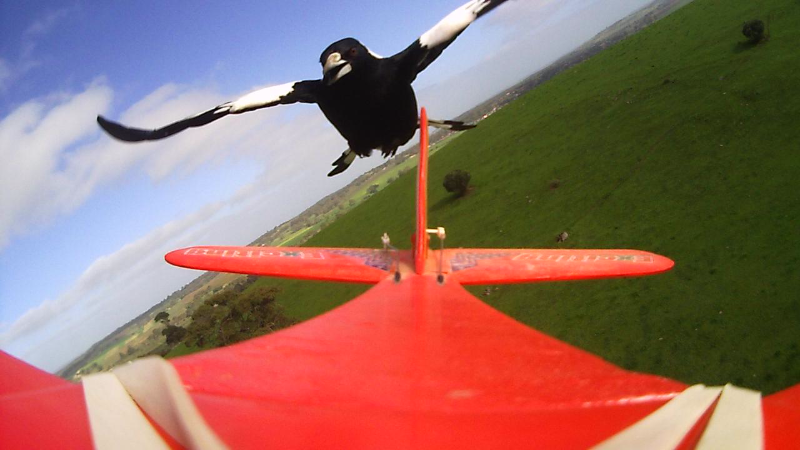 Buy something else – this things gonna kick your arse! 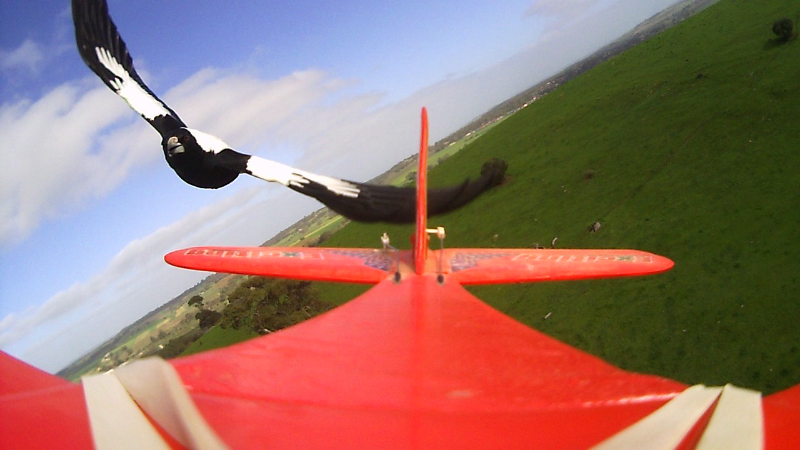 Double or triple your estimate of how long your video is going to take – your about to meet the ex-wife of software! I was switching between 4 project files this morning and suddenly Camtasia started saying that the project was corrupt – should we use the back up copy? Never answer yes! The back up copy is ages old! Render all source video in Camtasia’s own codec – yes a project for each video file. Yes you will need to check the rendering settings every time – some of them seem to be unset each time you return. 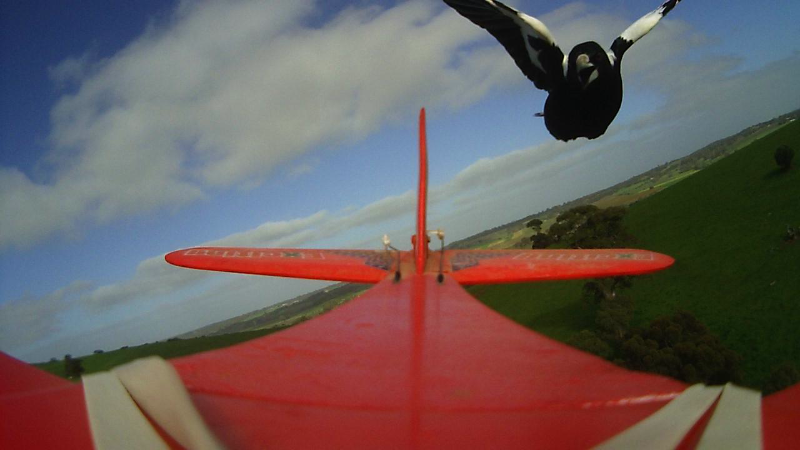 Always take backups every hour of working with Camtasia. 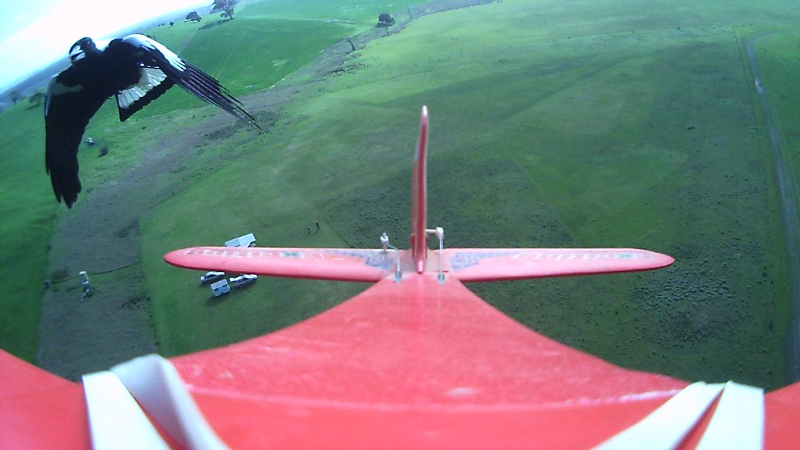 Always make copies of project files. – Multiple copies! 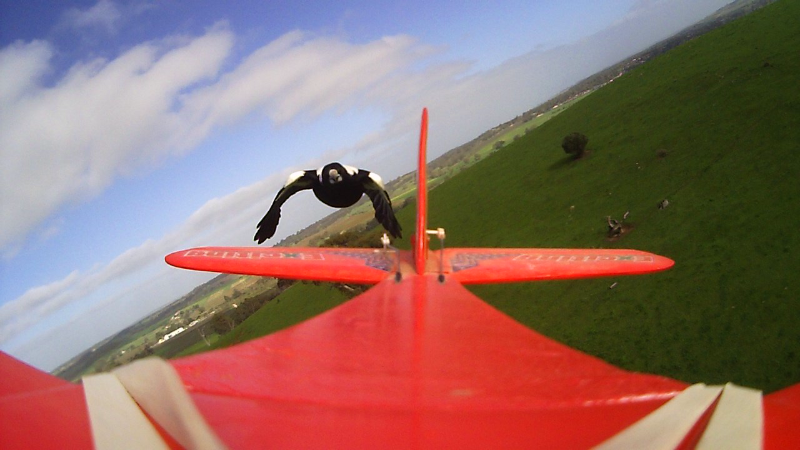 Never switch projects inside Camtasia. Exit and start again. 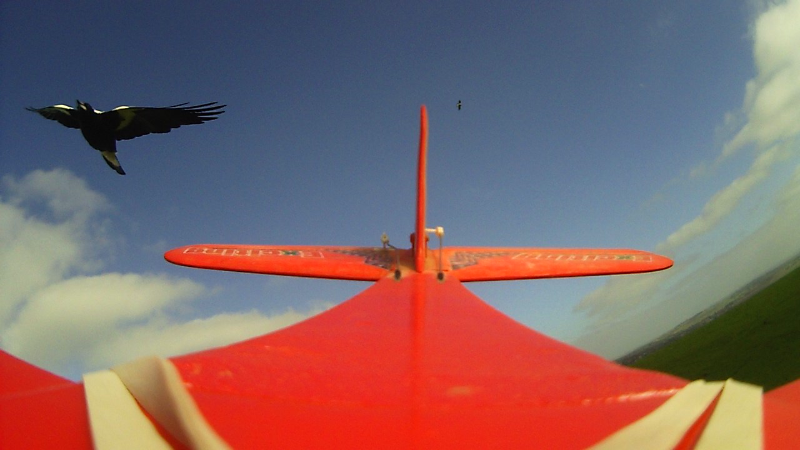 If you think that’s bad read about the audio work flow and the little ghosties. OMG! Don’t have comfort food within 100 meters – you will eat anything from the stress. 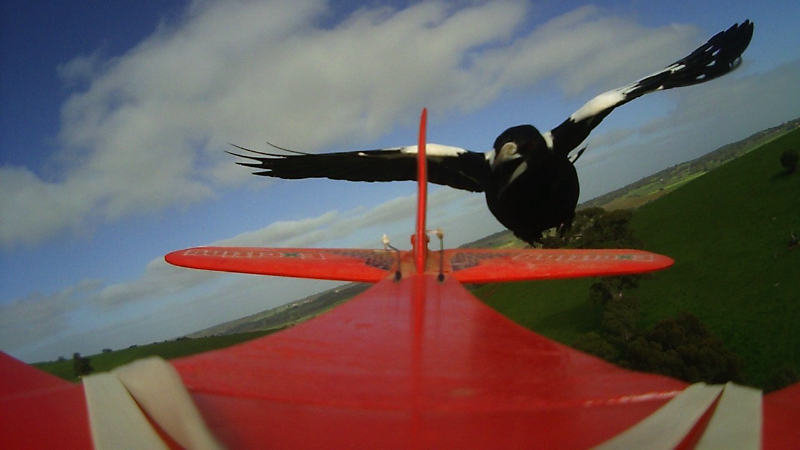 When I work with Camtasia, my darling wife regularly delivers fresh fruit so that I am constantly full and cant eat chips and chocolate – which she’s hidden. 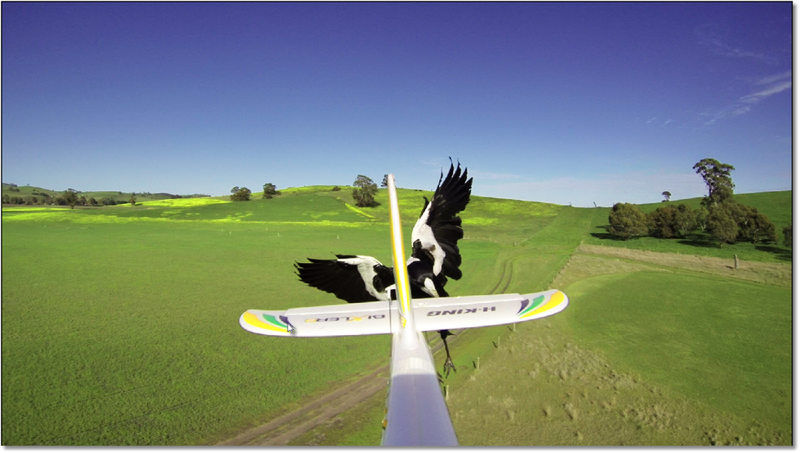 I know I am not the only one out there experiencing all of these Camtasia issues – if you could see the web traffic I am getting for these Camtasia stories – WOW! Had a tremendous day out flying today at my club’s flying field. 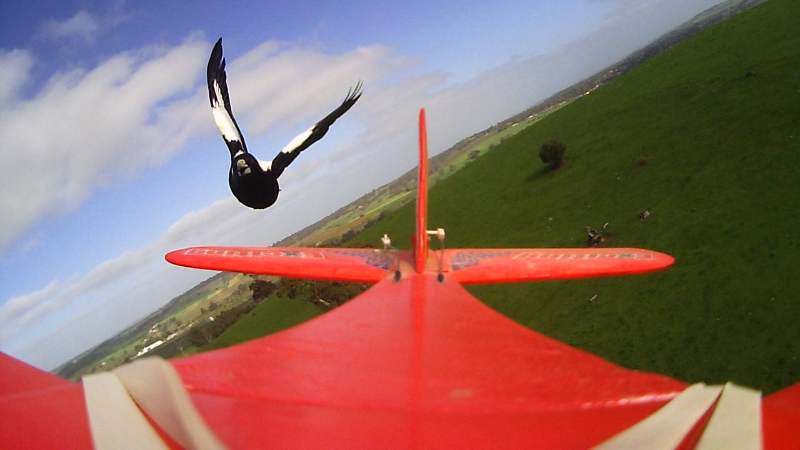 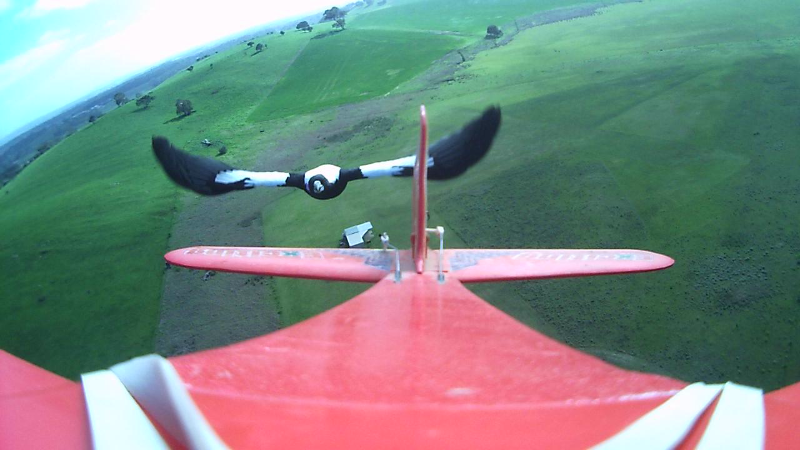 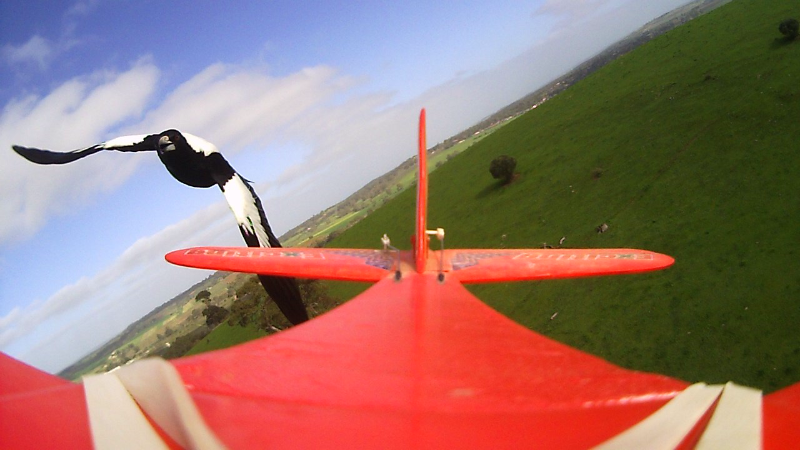 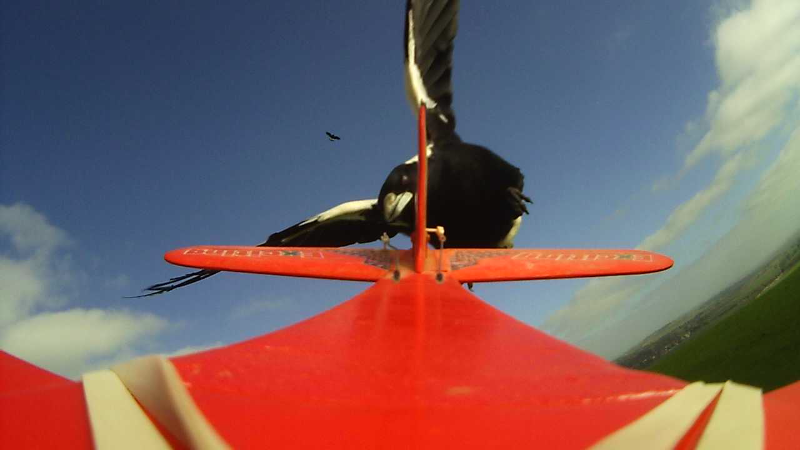 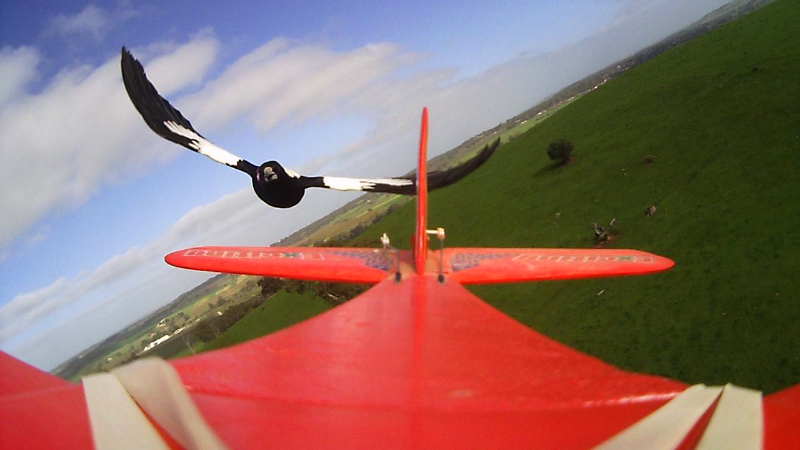 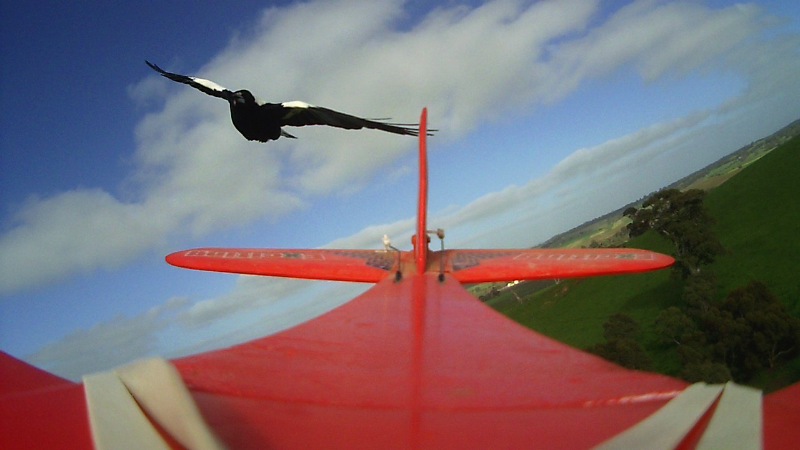 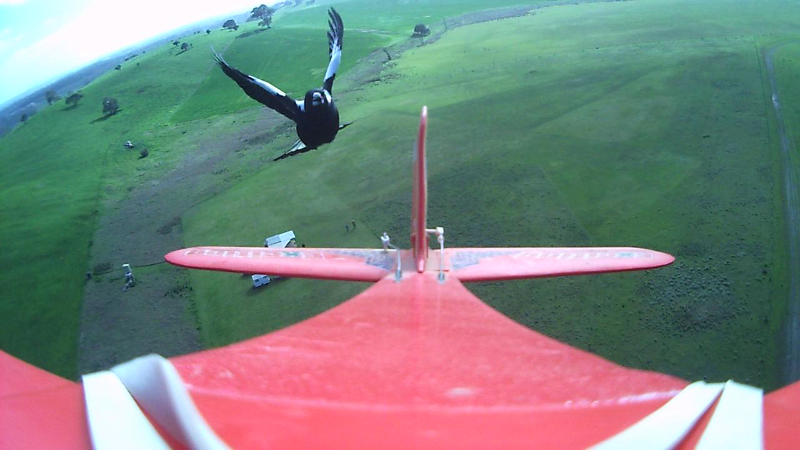 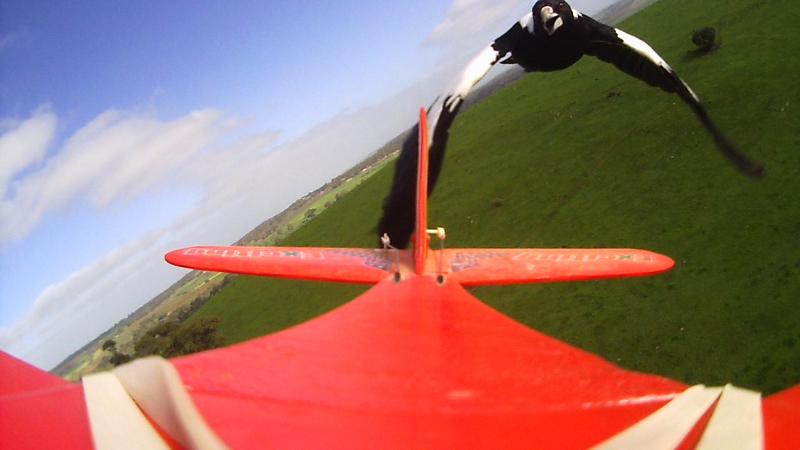 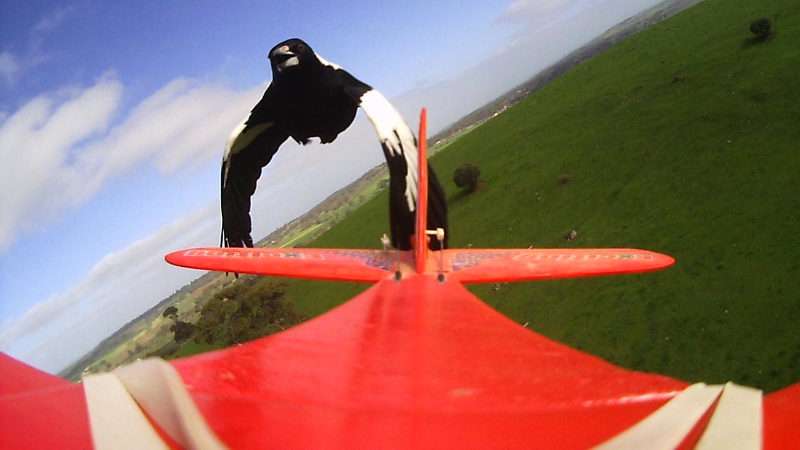 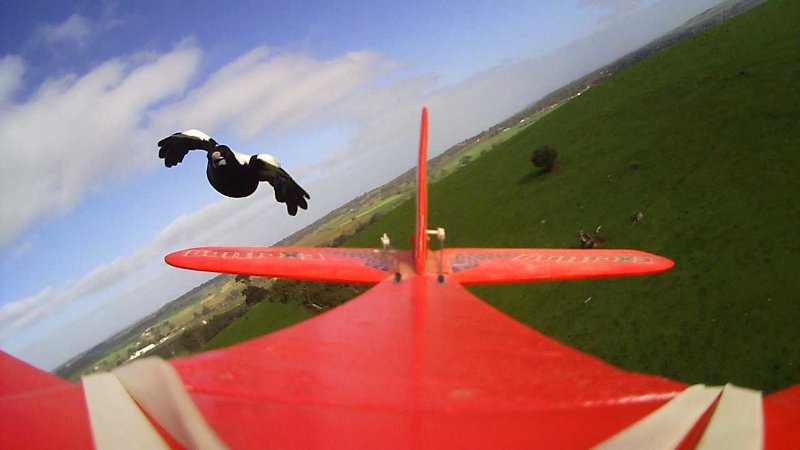 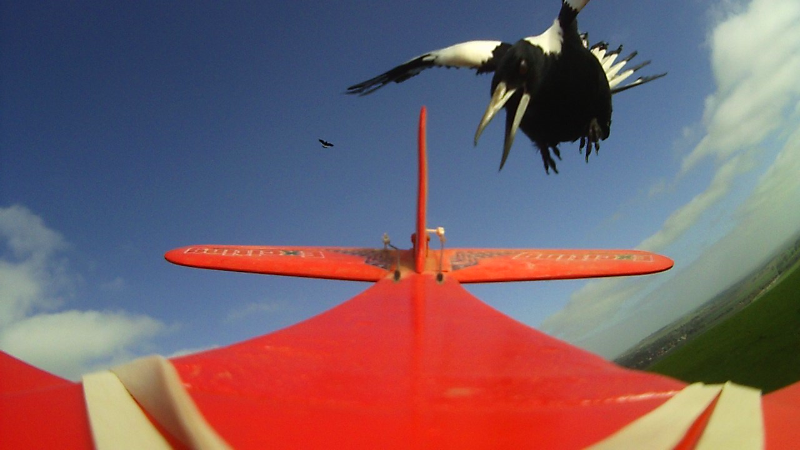 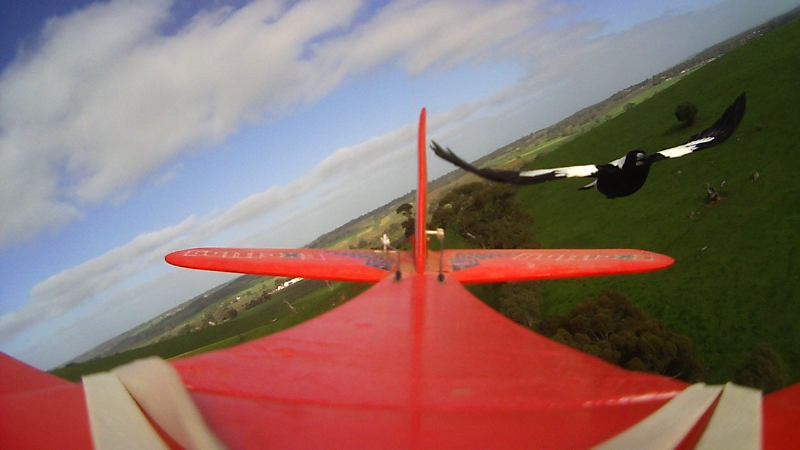 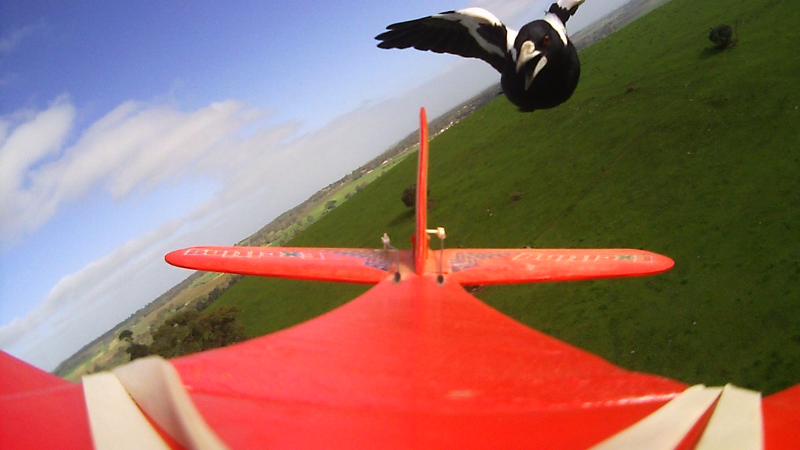 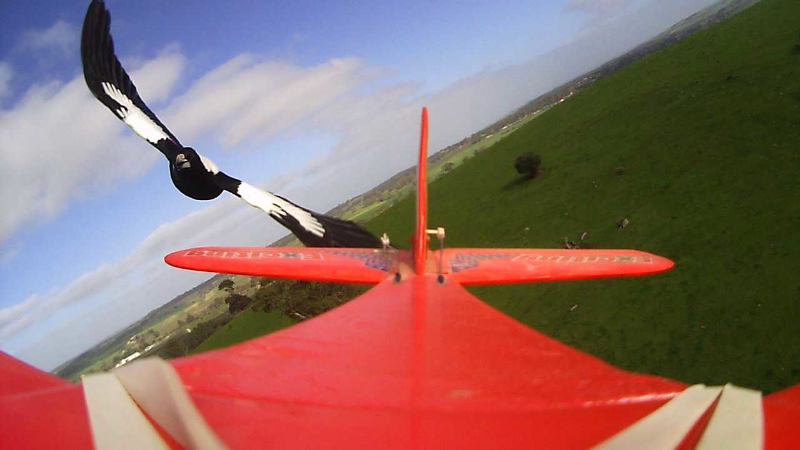 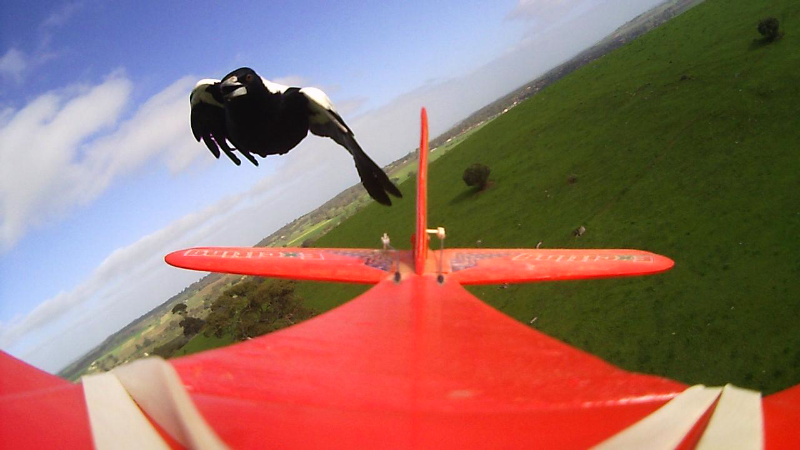 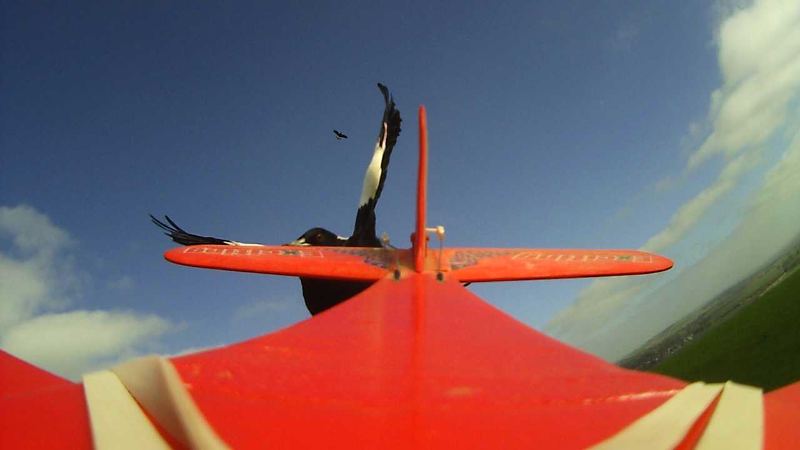 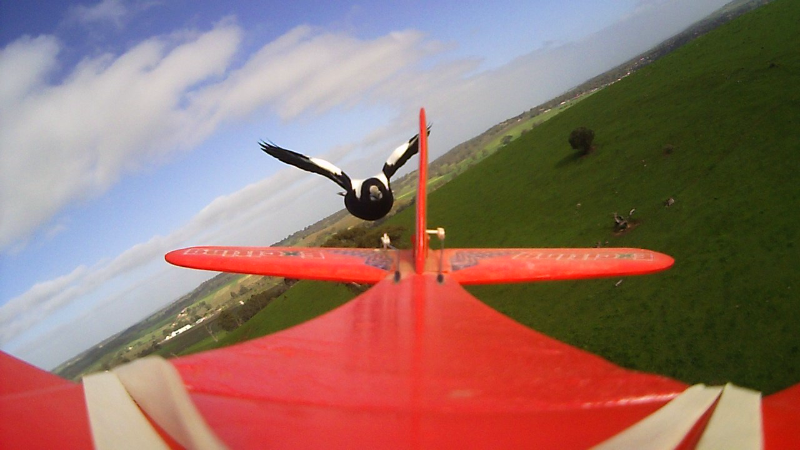 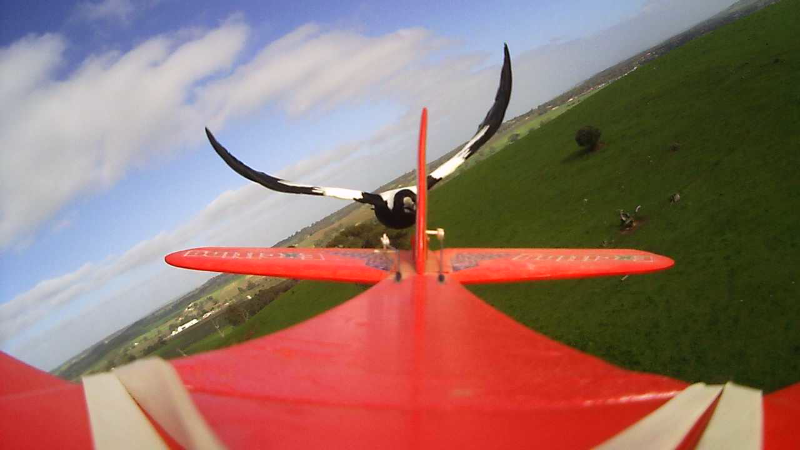 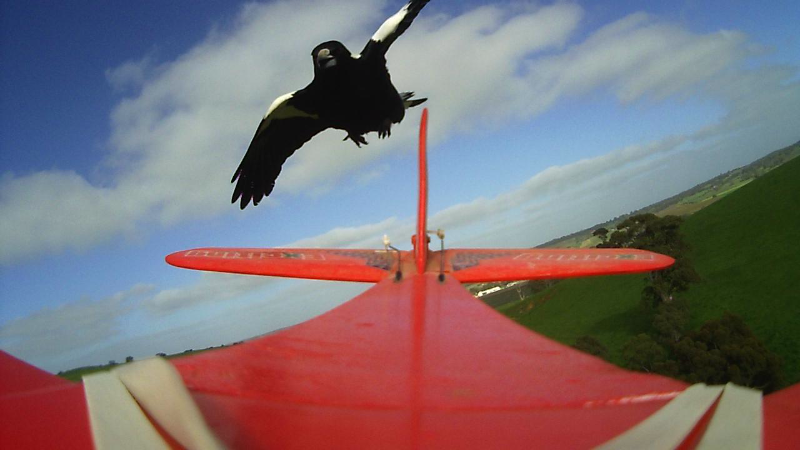 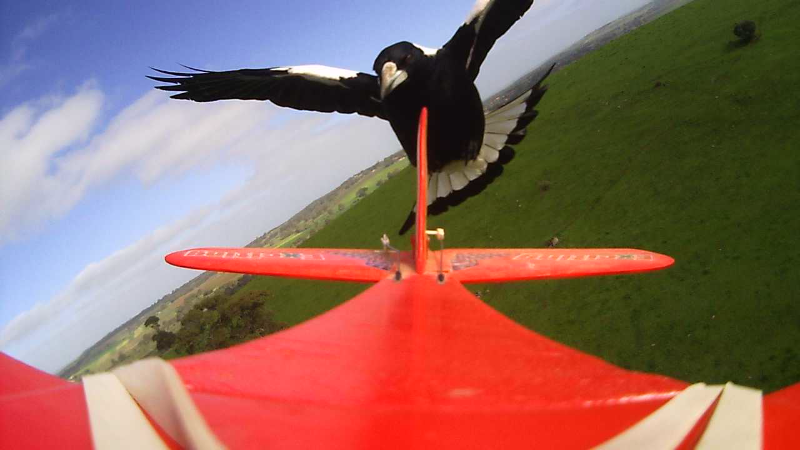 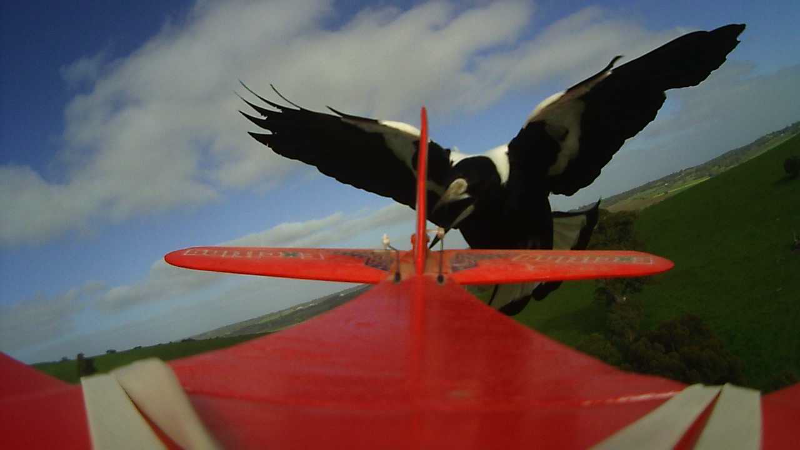 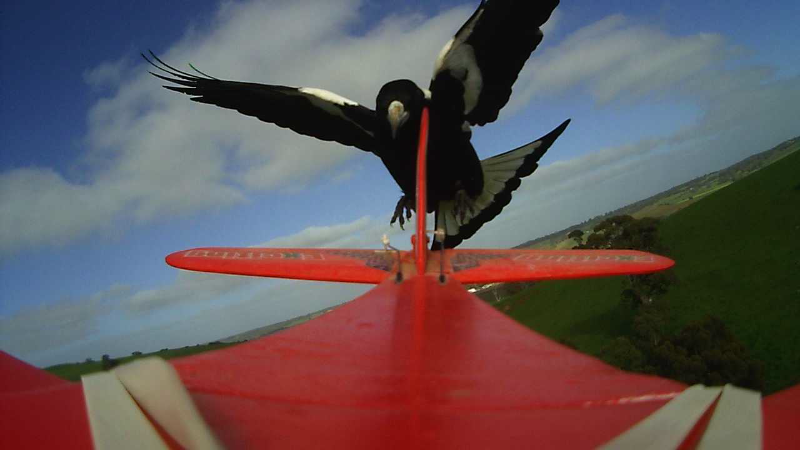 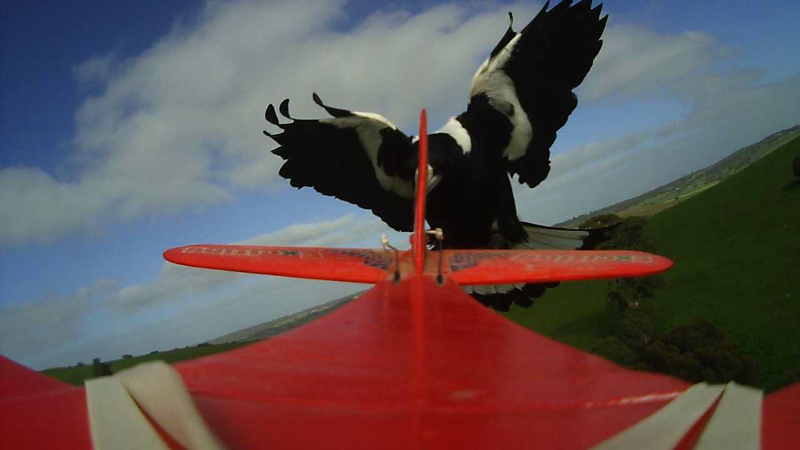 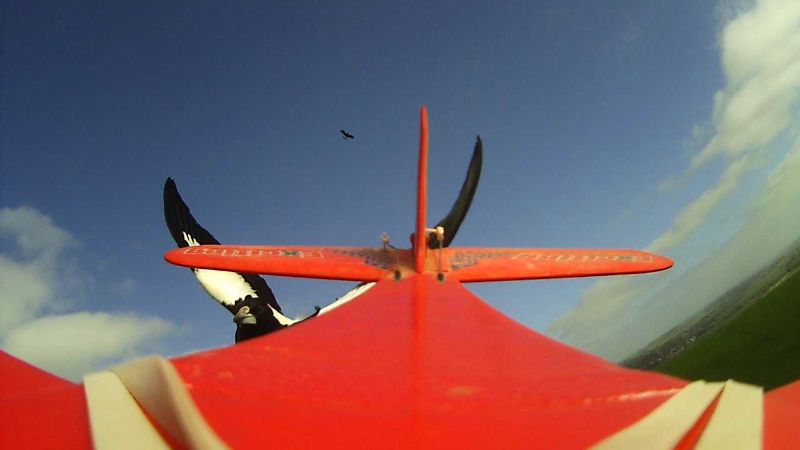 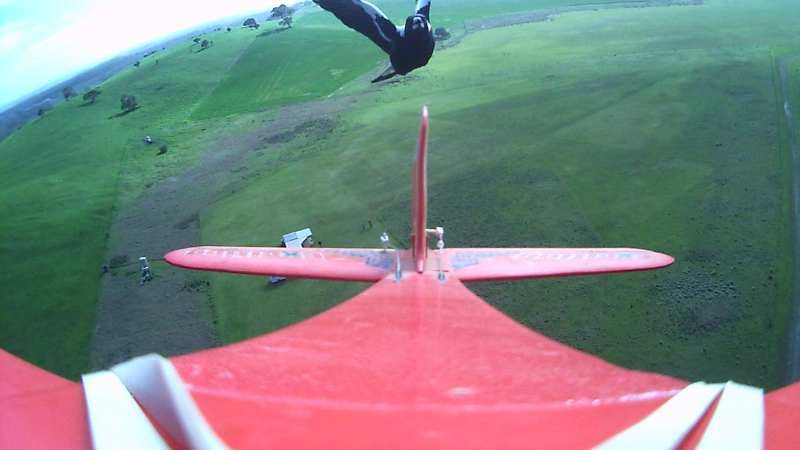 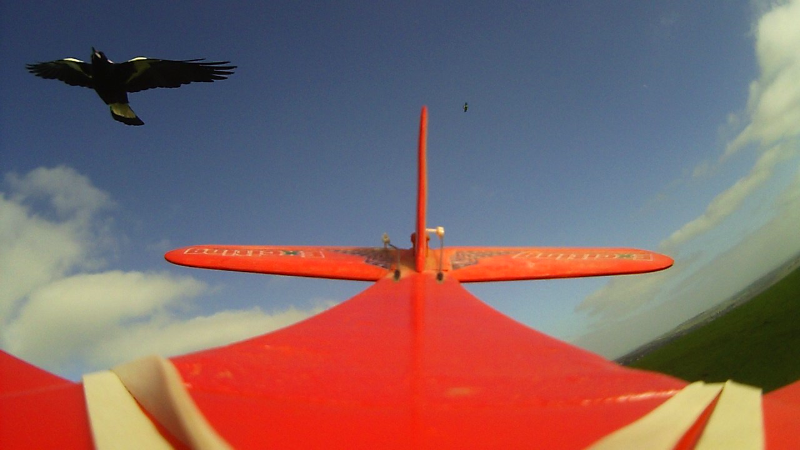 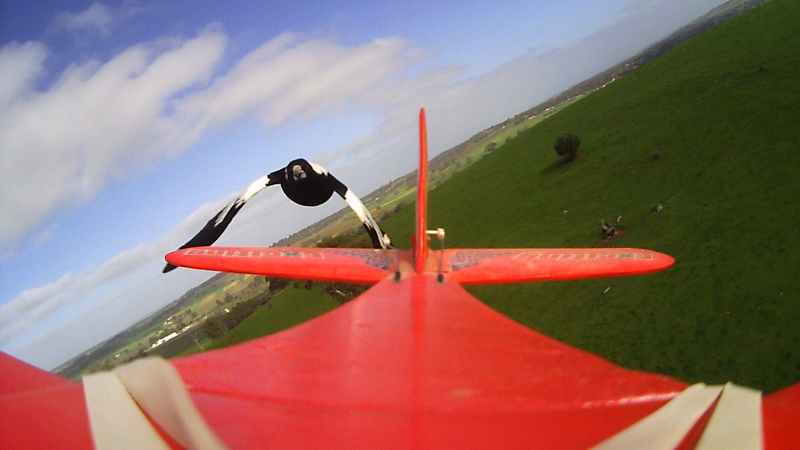 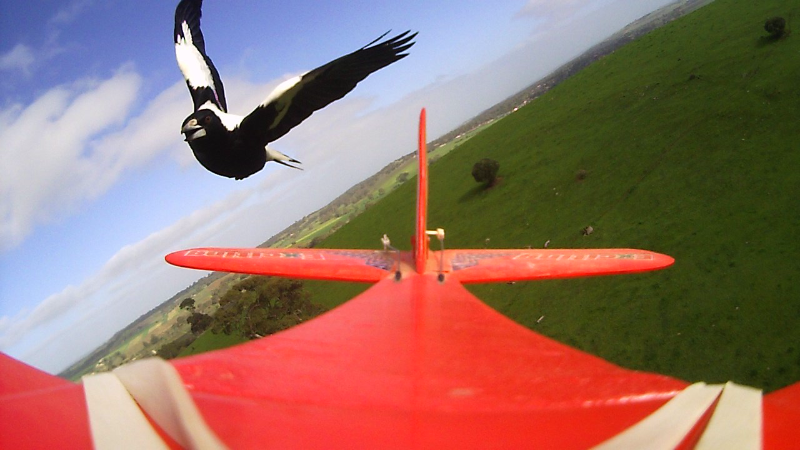 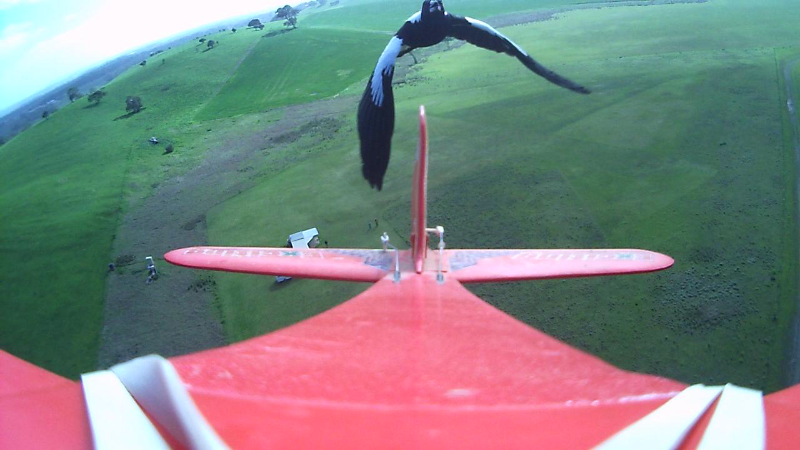 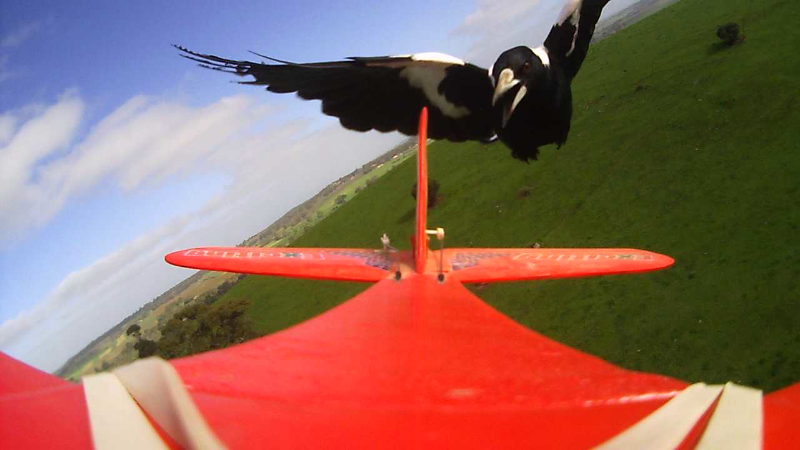 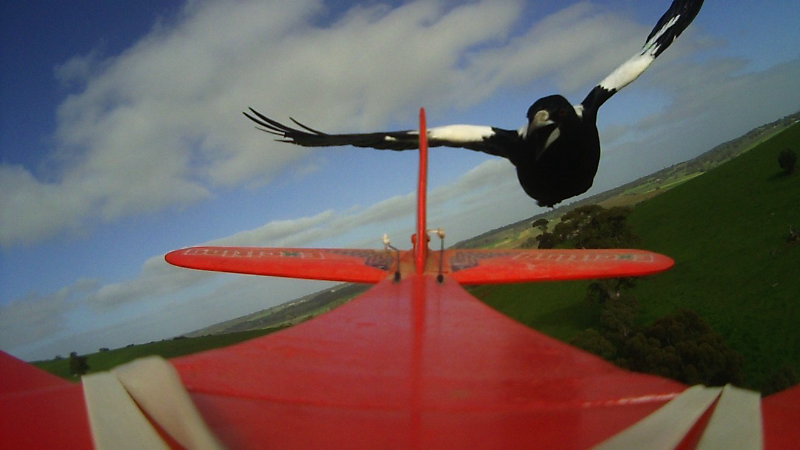 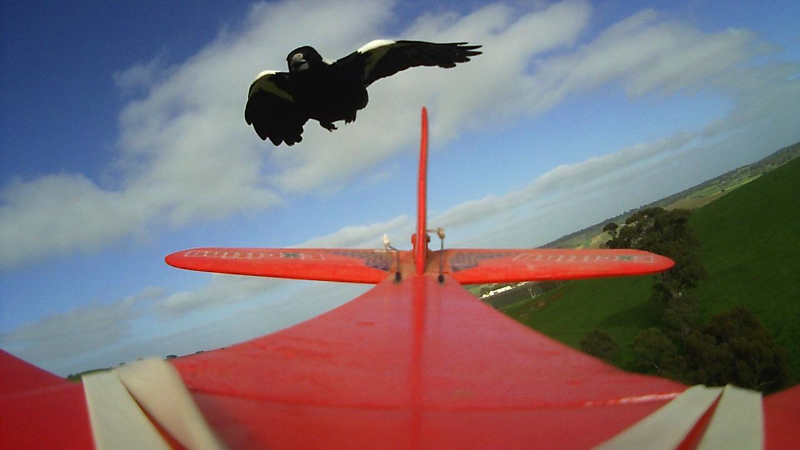 It’s that time of year when magpie’s chase our aircraft and attack them. 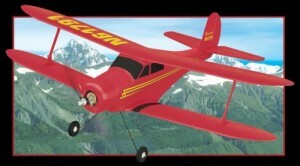 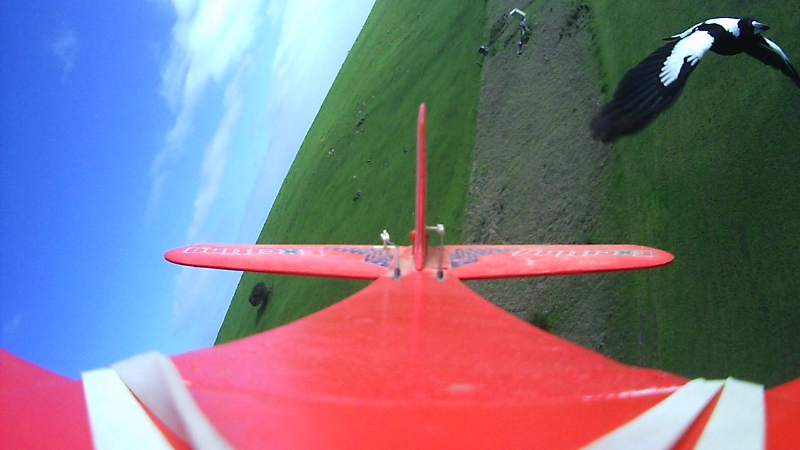 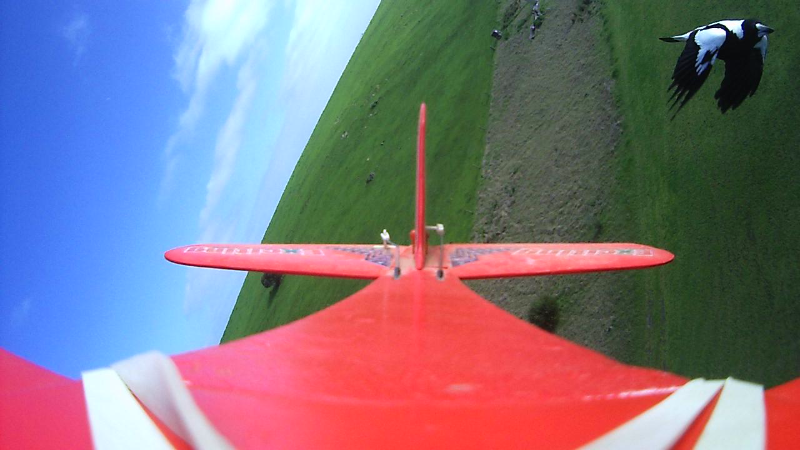 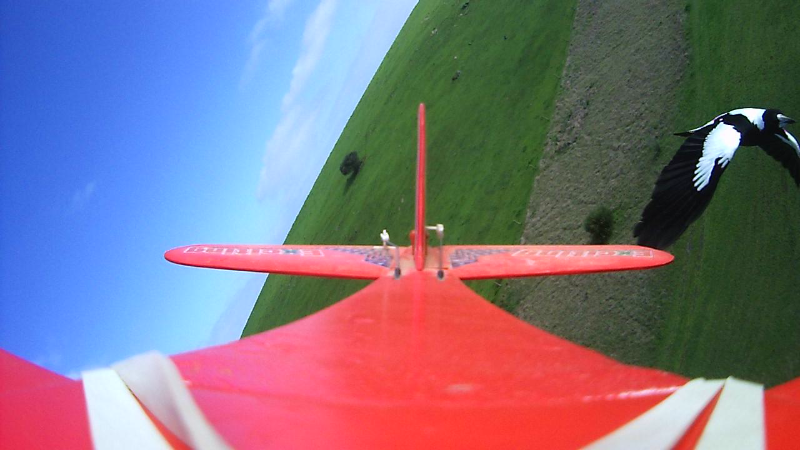 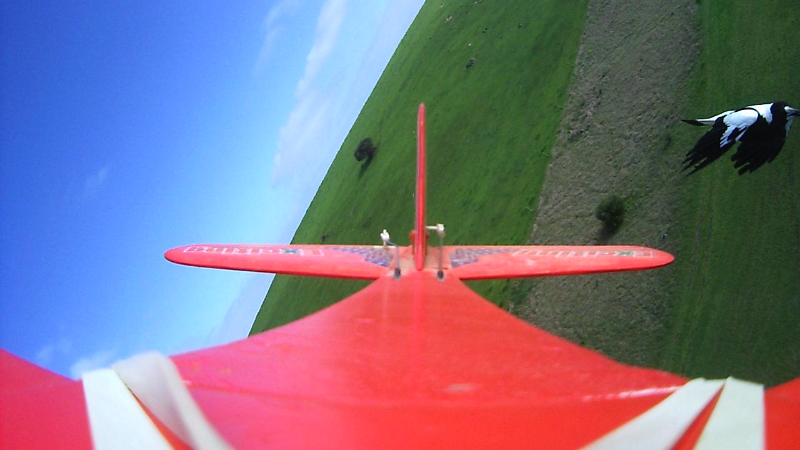 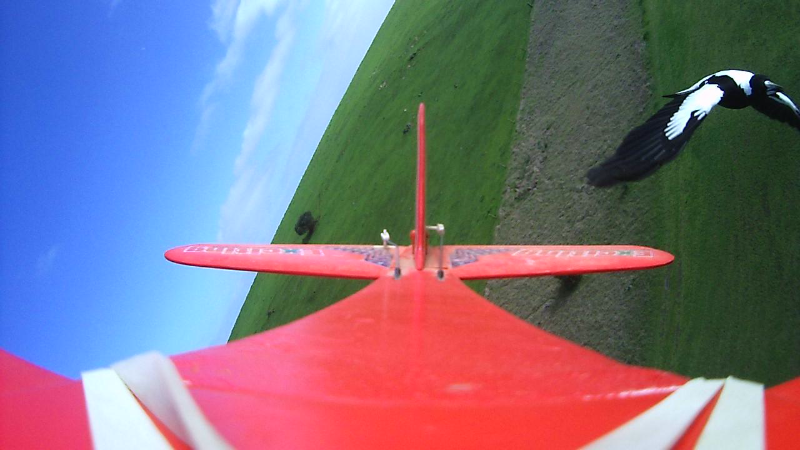 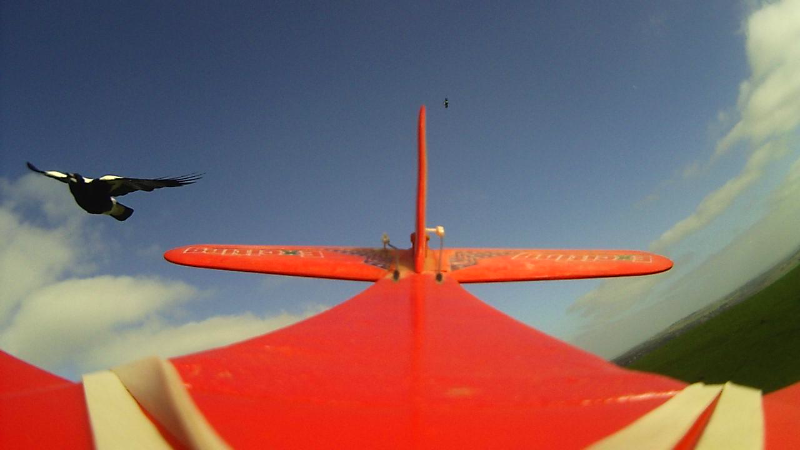 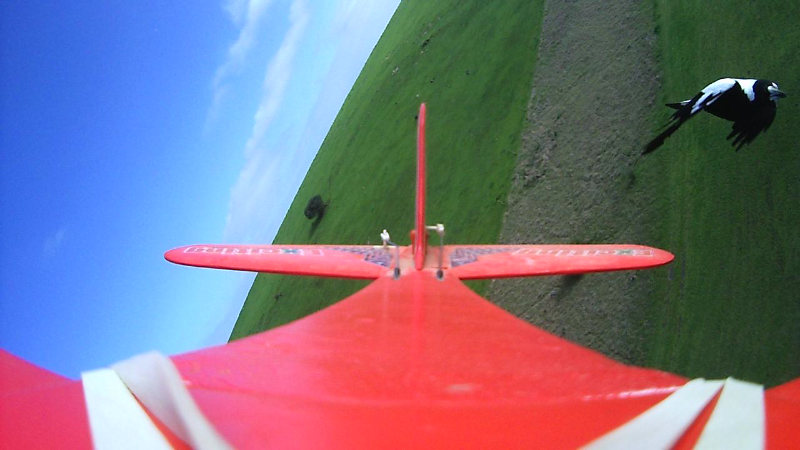 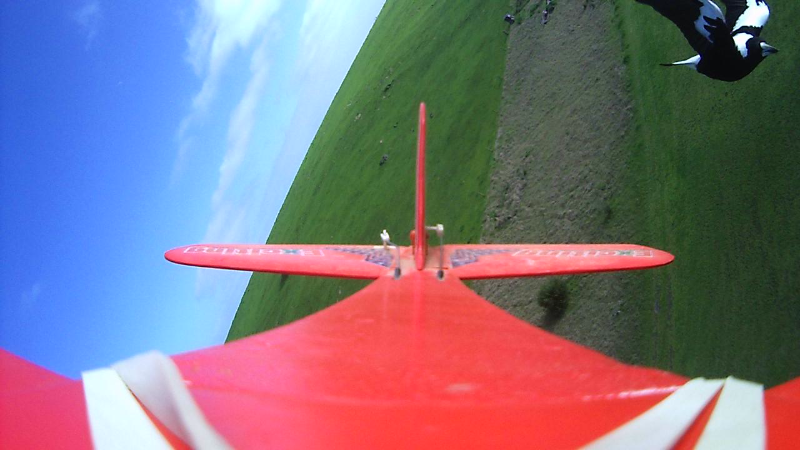 So I put the camera on my little red plane to see what a Maggie looks like in flight. These stills are individual frames from the footage and there are a lot of them here – but you really should step through them – there are a couple that are absolutely stunning – real wow material. 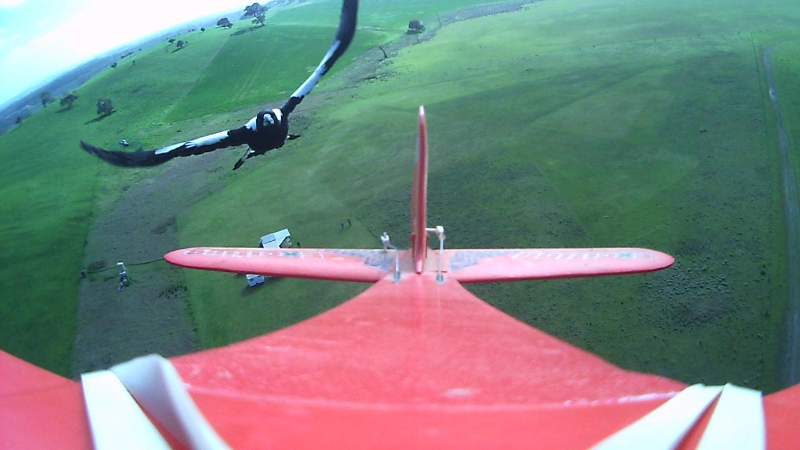 Old men: (Special instructions for the aged members of the Eagle Scale Aircraft Group) These photos will step through on their own every 7 seconds, or you can put your mouse on the photos and click through them. 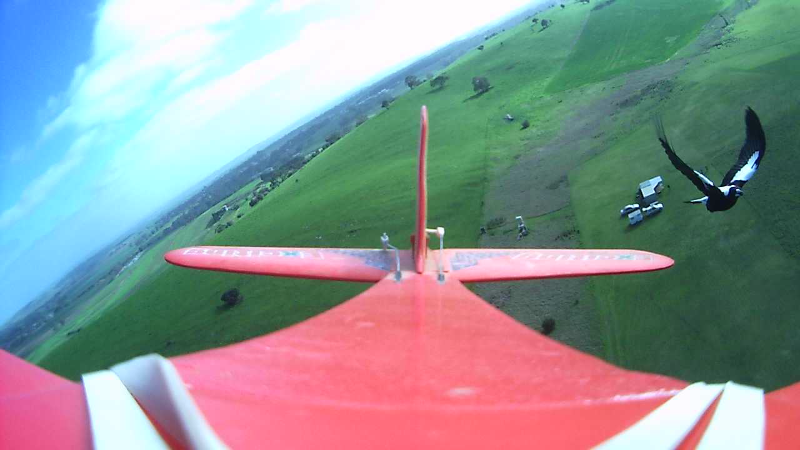 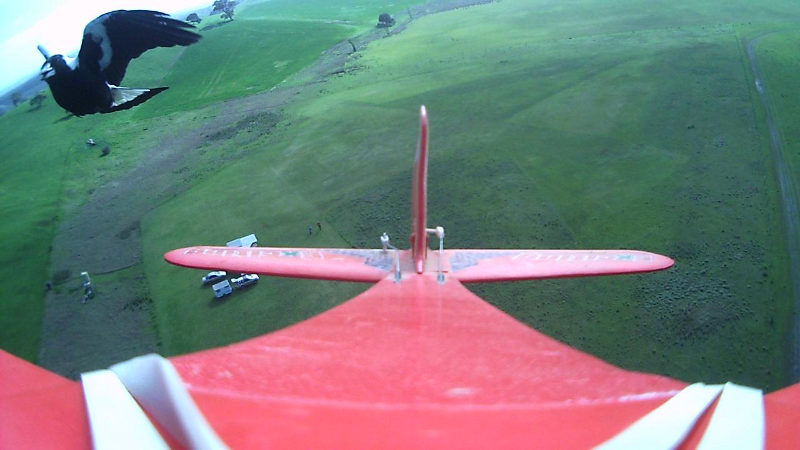 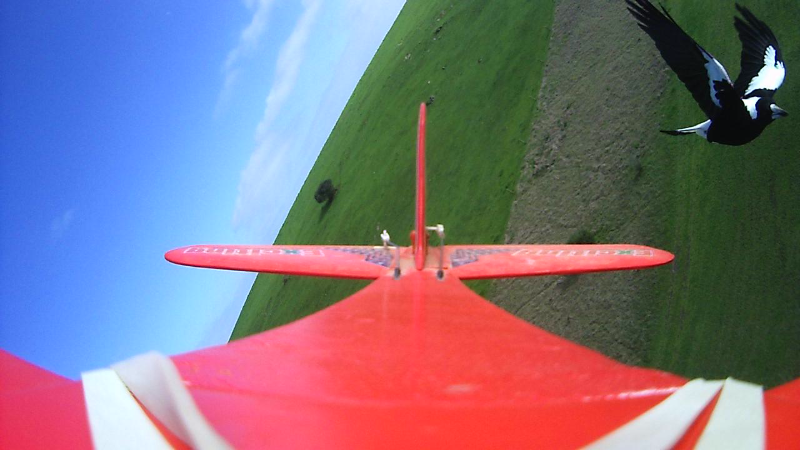 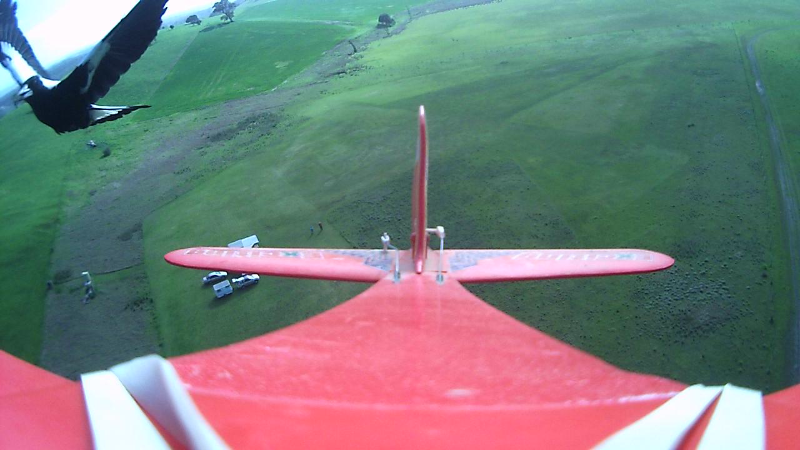 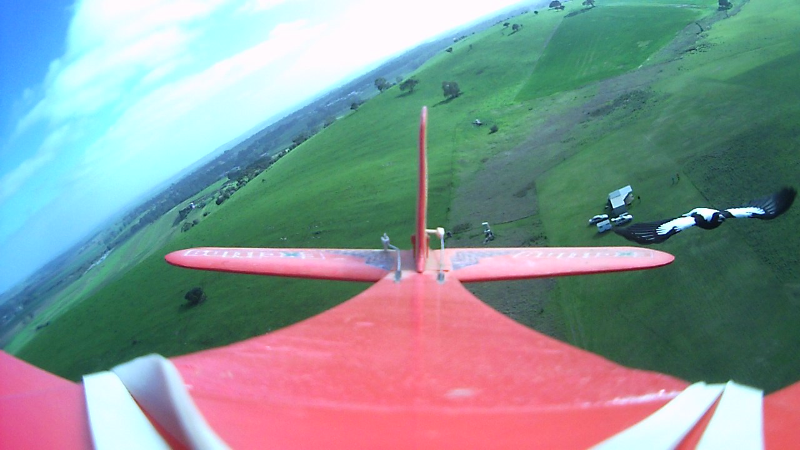 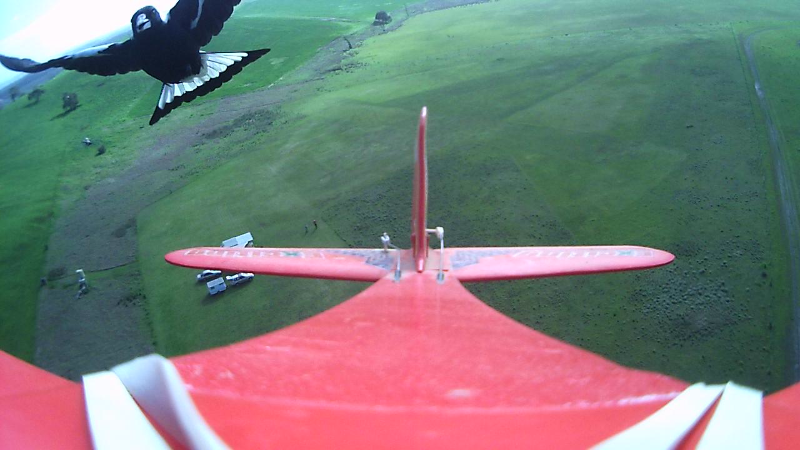 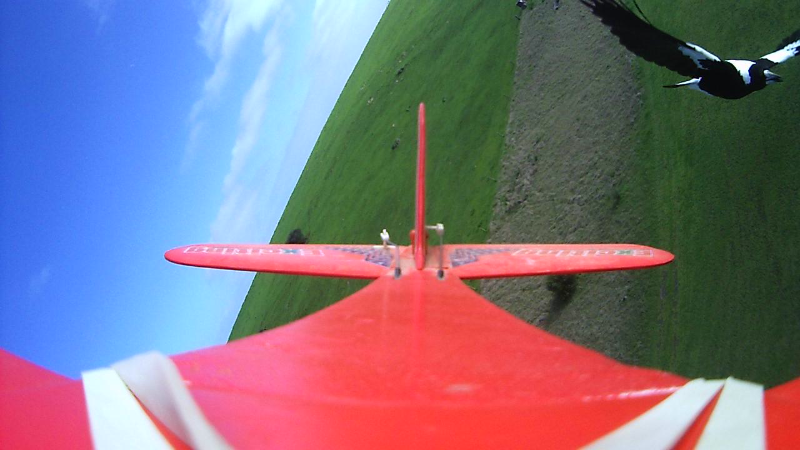 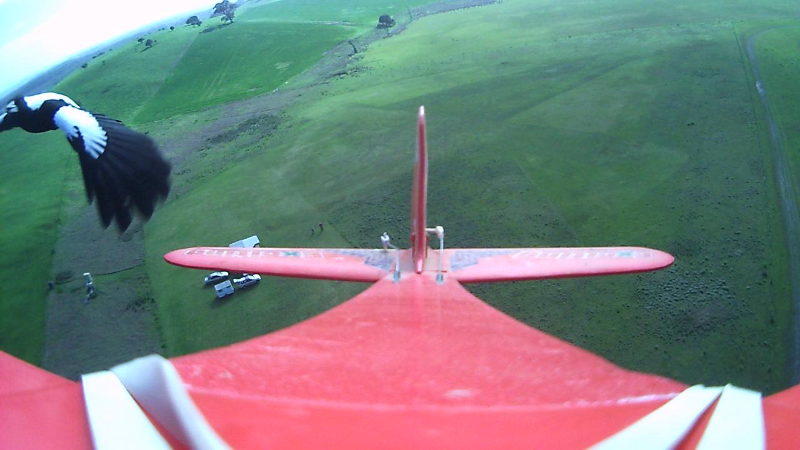 Filmed with my junk airframe a Flyzone Beech Staggerwing that has had the power plant updated. 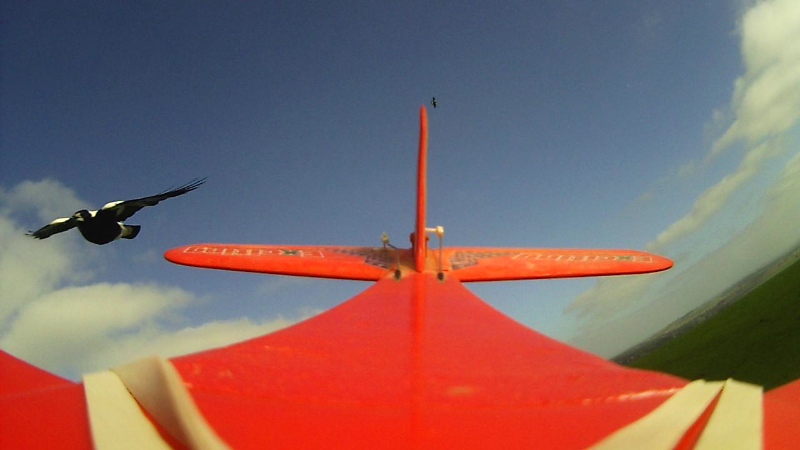 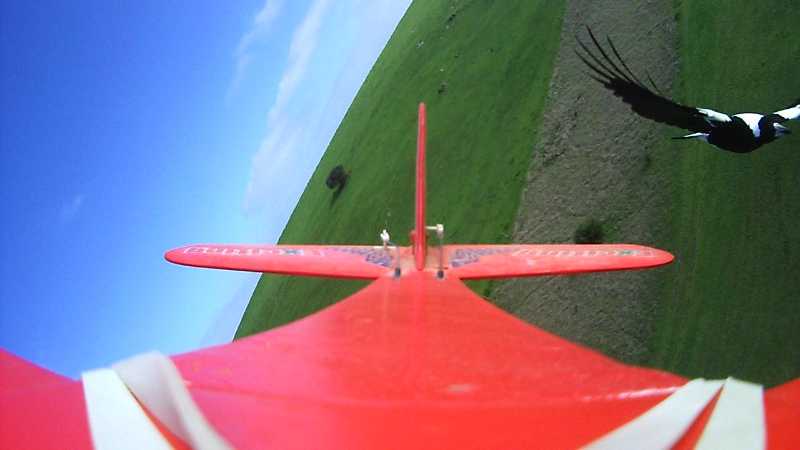 Yesterday (Sunday a week after I took the shots) I returned to the field and set up the little red stagger wing for a anther filming session. 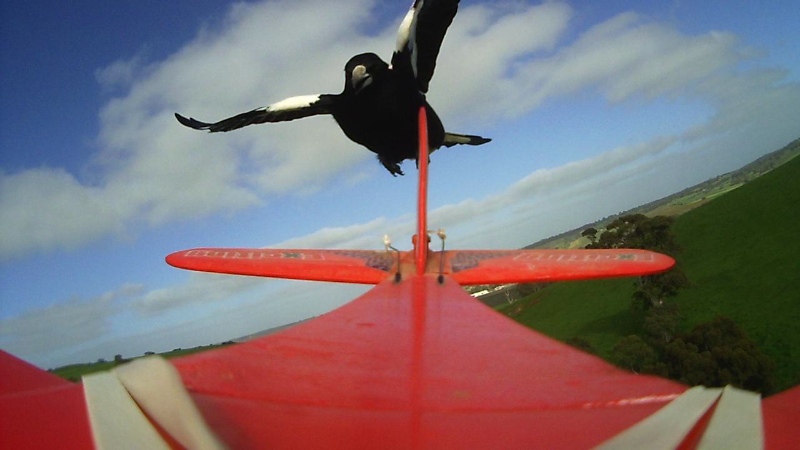 On take off she didn’t seem to want to climb and after about 50% of a circuit she went into the ground right wing tip and nose. 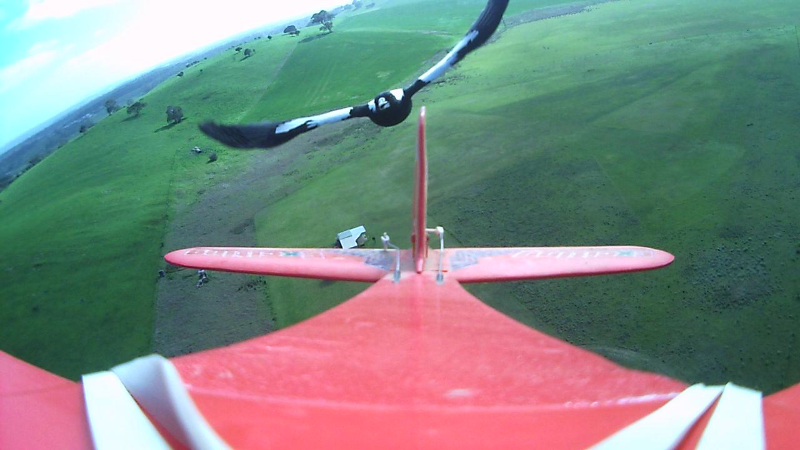 The tail didn’t hit the ground. I have just completed the removal of the radio and motor etc. When I got to the servo tray (which was very brittle) – the elevator servo was basically smashed out but the rudder one wasn’t. 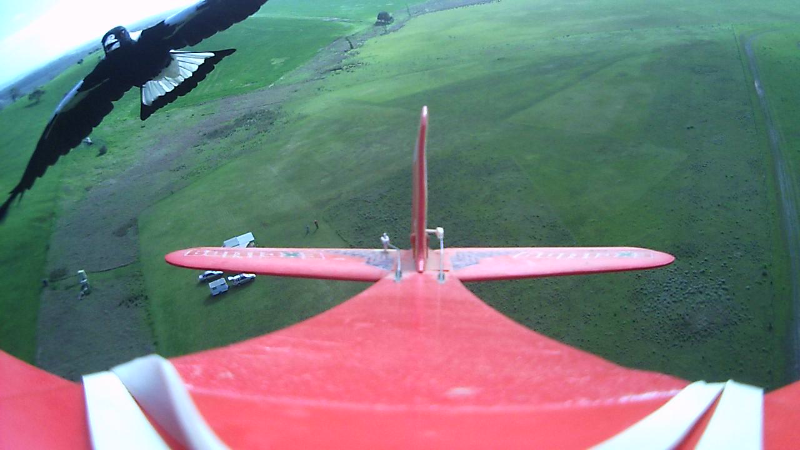 This fits what happened when I was flying, we didn’t seem to want to go up much. 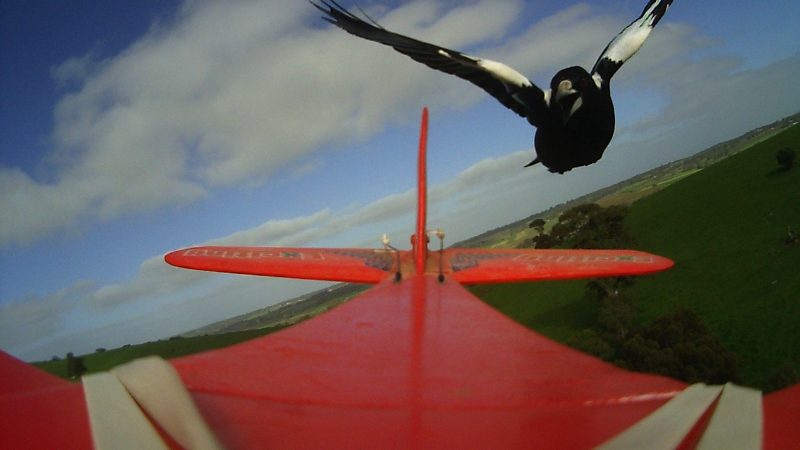 Perhaps the magpie won the battle after all!